Too much has been going on in the world. Too much. I am so angry. Too angry to even put the feelings into words. I am sick and tired of arguing that institutional racism actually exists; I am tired of trying to convince others that black people are human beings, especially to other people of color. It’s nauseating and tiresome. I can’t imagine what it is like for black people walking about this life every day knowing there is someone out there who fears them simply because they are black. How much time must they spend proving that their lives matter? Why do they even need to spend time proving such a thing? Black lives matter. Really! I don’t even understand how anyone can see it any other way. I supposed it must be similar to how I have to try and convince others that Palestinian lives matter—that we are not terrorists and that we have feelings and desires similar to everyone else. Stop blaming the victims. When a group of people is segregated into an area, denied resources and opportunities, is harassed, has violence committed against them, is portrayed as uncivilized human beings unworthy of life, and is oppressed for decades upon decades, or centuries upon centuries, resistance is justified. The oppressed are not to blame because they rise up, become full of rage, and at times, snap into violence. I am tired of people ignoring the systematic racism that is the root of all of these issues. From Ferguson to Gaza, USA to Palestine, Native Americans to Black South Africans, and on and on. The issues are not completely the same, but are they oh so similar and quite connected. It’s not enough to be angry. Time and time again we are angry. We rise up angry. We demand human rights. We demand civil rights. And then we are placated. We are pacified and soothed by our temporary stint of outrage and perhaps our lack of hope in any change and time to make it happen. It seems that in this country, the good old USA, change will only occur once every last person is in the street, when even the most well off person has become touched by the horrid nature of this world, has personally become affected by the oppressions running through the streets. We do not need to wait for the day, however. We all must act now and act every day. Enough is enough. How many Mike Browns or Oscar Grants or Renisha McBrides or Trayvon Martins have to perish before we realize something is incredibly wrong? What has changed since the Civil Rights Movement? It seems like nothing has changed except for the blinds that have been put over people’s eyes to make them believe in the guise of a “post-racial society.” Well, wake up! That world does not exist. So many images coming out of Ferguson are scary and depressing, yet they are also inspiring. These protestors are standing their ground in the face of a heavily militarized police force, one that calls these brave black souls “animals.” What is happening—and has been happening for decades—is disgusting. It needs to stop. We need justice for all lives. All life matters. I hope the rage coming out of Ferguson spreads to the entire country. It it way past due. Let this rage consume us all. 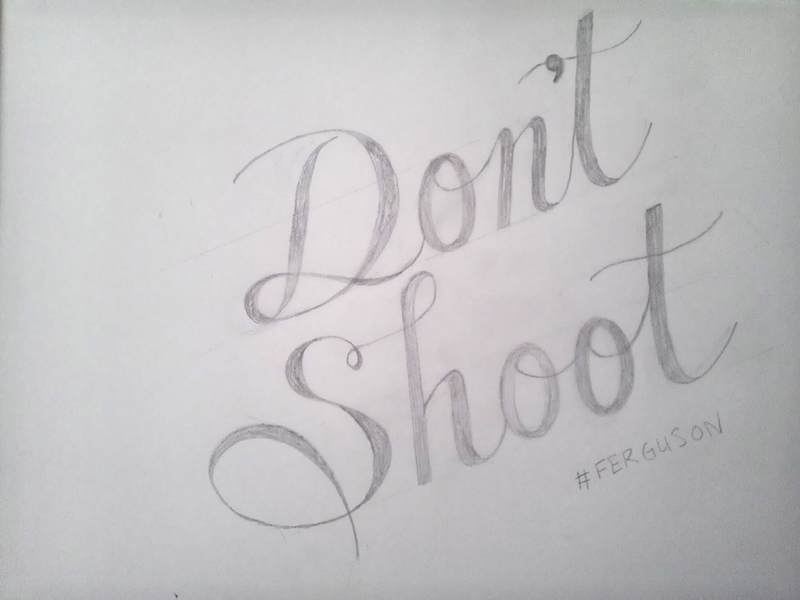 Inspired by the events in Ferguson, the courageous people in that community, and the last moments of Michael Brown, I sketched “Don’t Shoot” in a way that contrasts the terrible elements of those moments yet flows with hope.